Micro SD Cards are reliable photo and video storage for phones, iPads, PDAs and more. Available in a full range of sizes, speeds, and accessories. Micro SD is a type of removable flash memory card used for storing information. 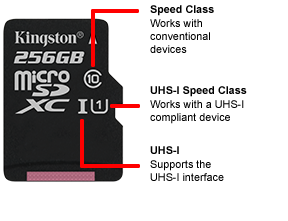 SD is an abbreviation of Secure Digital, and Micro SD cards are sometimes referred to as µSD or uSD. The cards are used in mobile phones and other mobile devices. You’ll most often come across two types of microSD cards — SDHC and SDXC. The difference between the two is the range in capacities they provide. SDHC cards have a capacity of 2GB to 32GB. Alternatively, SDXC cards can range from 32GB to 2TB. You might be tempted to choose the largest capacity, but you’ll need to check what your device supports. Our expert staff can help you find the perfect Micro SD card for your requirements!